Karnataka Assembly Election: PM Narendra Modi attacks Congress on farmers' issues saying the party is not serious about their welfare. 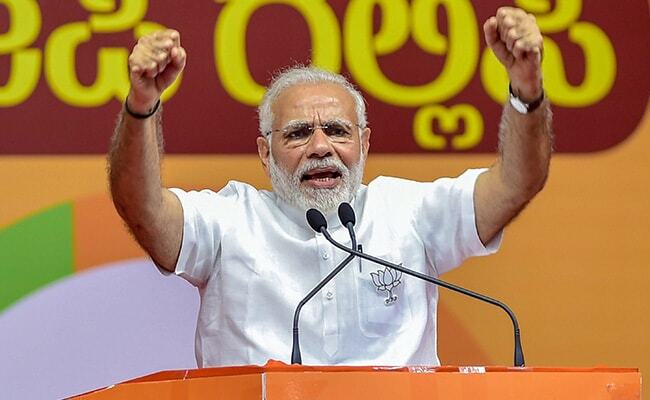 New Delhi: Gripped by election fever, the southern state of Karnataka is set to see four public meetings by Prime Minister Narendra Modi today, a day after the BJP released its election manifesto underling loan waiver for farmers, among other poll promises. Congress Chief Rahul Gandhi, however, hit back at the BJP saying the manifesto was "poorly crafted" and had nothing new to offer. Leaders from both the BJP and Congress have engaged into a war of words in the run up to the polling day on May 12. This week, PM Modi has attacked Congress, currently ruling the state, on several instances over condition of farmers, safety of women, and corruption in the state. He even said that the "garden city of Bengaluru" had turned into a "garbage city" prompting a reaction from Rahul Gandhi. Mr Gandhi called PM "a natural liar" and said he had insulted Bengaluru by giving it the label. "After Karnataka polls, Indian National Congress will become PPP Congress - Punjab, Puducherry and Parivar Congress," PM Modi said today in Gadag. "It is the people of Karnataka who are going to make the Congress into a regional Party called PPP Congress," he said. Amit Shah is holding a road show in Karnataka. Devoting a considerable part of his poll speech in Tumakuru, PM Modi said, "It is the JDS that is working to save a Congress, they will align, so vote for BJP." "Although respected Deve Gowda ji wanted me to lose elections, I always showed respect towards him," he said. A day after the BJP made a slew of poll promises in its Karnataka election manifesto, PM Modi yet again took a swipe at Congress. "Congress is trying to offer false rhetoric and empty promises to the famers. The Congress' neglect of the agriculture sector is very well known. I wish they were serious about the welfare of the farmer," he said. PM Modi is addressing a rally in Tumakuru. Rahul Gandhi tweeted the same video and said PM Modi's words did not match his actions. "You talk a lot. Problem is, your actions don't match your words," he posted. Siddaramaiah on Saturday launched a fresh attack on PM Modi and said corruption allegations made against his government were "baseless". Dear PM @narendramodi avare, I am glad you have made corruption an issue in this Election because that is your weakest point. You are making baseless allegations of corruption about our Govt. BJP National President Amit Shah will also hold several roadshows in Mysore. Several key party leaders are participating in the poll campaign. PM Modi this morning tweeted about the four election rallies he is scheduled to address in Karnataka. "Today once again I have the opportunity of connecting with my sisters and brothers of Karnataka. Would be addressing four rallies across the state," he posted on the micro-blogging site. PM Modi will address the first rally in Tumakuru at 11 am. Here is the schedule of Shri @narendramodi's public rallies in Karnataka on 5th May, 2018.